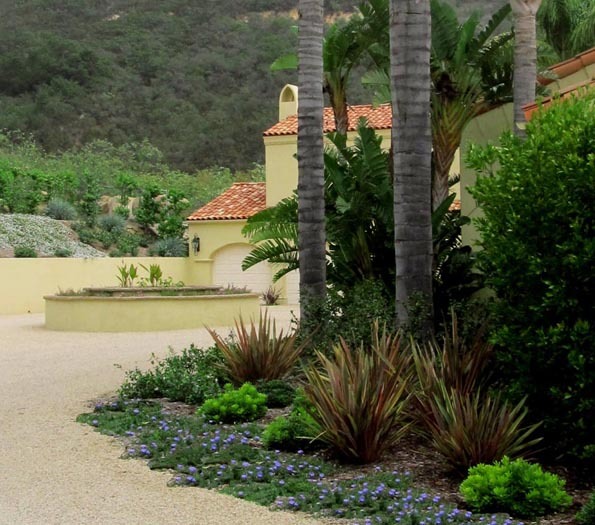 After an extensive remodel of this estate's house, the owners realized that the exterior landscapes needed a complete overhaul as well. The old gardens were tired, poorly conceived and constructed, and the gorgeous views of the ocean, coastline, and Santa Barbara Channel Islands were completely blocked by invasive species of plants and trees, and harsh fencing materials. And we needed to reduce the severity of the barren "hardscape" areas (ie., remove and replace patio paving materials) to create green, lush, and inviting spaces with a more natural and harmonious flow. In addressing these issues, the results are absolutely magnificent. 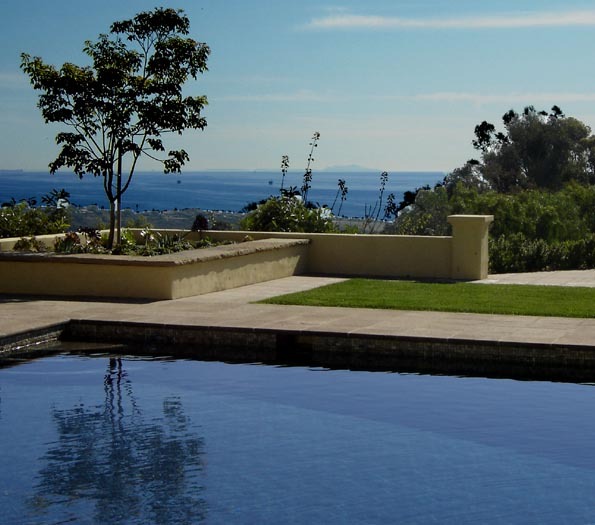 Now, this secluded 3-acre estate's home rests impressively atop a majestic ridge surrounded by endless, panoramic mountain and Pacific Ocean views. 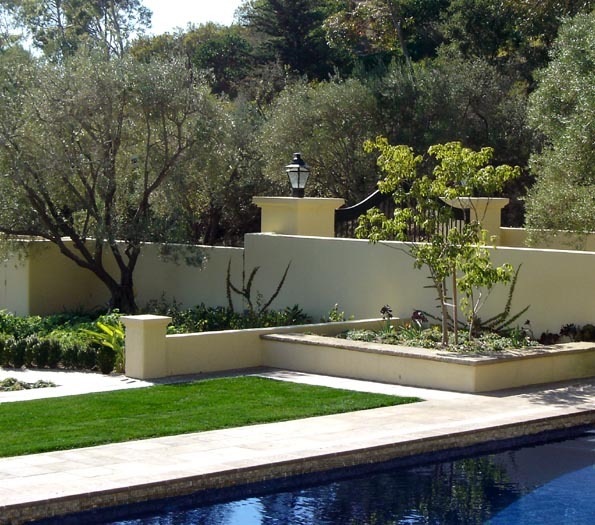 One of Montecito's most prestigious private residences, the garden areas are now a perfect compliment – maximizing the experience of the grandeur that is and surrounds this premier property . 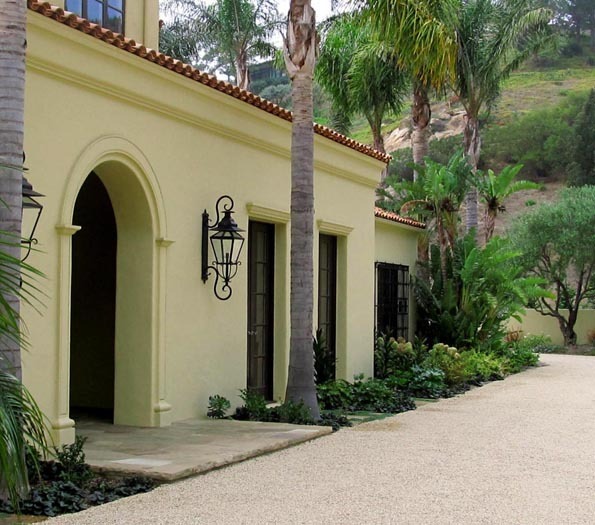 This is "the Santa Barbara dream" at its best – indoor / outdoor living, gracious entertaining spaces, luxurious amenities, and inspiring surroundings that are unsurpassed. Fruit producing olive trees with Mediterranean plantings, tiered gardens, and expansive views are reminiscent of an old world Italian villa. And the French doors open to reveal colorful and captivating terraces, manicured gardens, inviting patios, and the Santa Barbara coastline beyond. A peaceful meditating Buddha statue is tastefully positioned with the framed-in views of the Channel Islands as its backdrop. We removed old fencing along with invasive plant and tree species to open up and reveal expansive coastline and island views just beyond the swimming pool and spa. Thoughtful design that incorporates lush looking (but low water use plantings and trees) now frame that amazing view, creating unforgettable and breathtaking drama to any event with family and friends. And we moved some sizable, established (non-invasive) trees already existing on-site and used them elsewhere on the property to punctuate and highlight other garden areas. A new rose garden provides generous blooms for table top displays while the new fruit trees and organic herb/ vegetable gardens provide a bounty for healthy and delicious dining. We designed and installed a charming garden gate to coordinate with the existing ornamental iron work on the house itself and the driveway entry gate. Just beyond the entry gate, we designed an expansive motor-court with a grand circular stone fountain at its center. Also incorporated into the landscape is the oversized 3 car garage, (roomy housing their high- end, luxury cars) and a North/South facing tennis court. 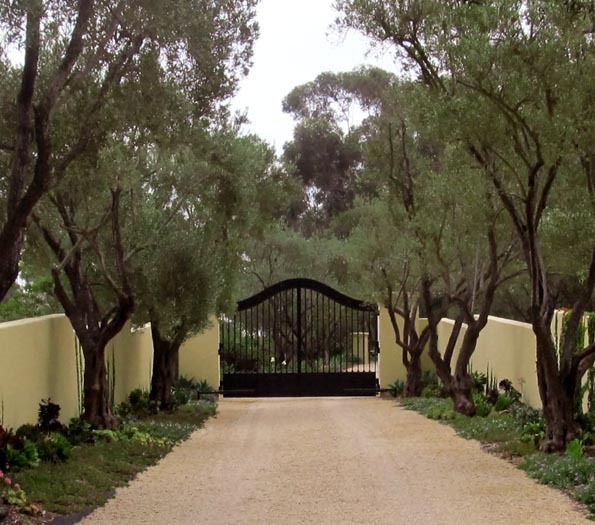 Great care and consideration was given to incorporating only compatible "companion plants" around the sensitive and majestic native oaks trees to protect their health and longevity. Minimized large thirsty lawn areas down to a 400 sq. ft.area – just enough to sun bathe by the pool. This also greatly reduces noise and petrol pollution from mowers. Gravel paths allow for rainfall to soak in and recharge the water table and reduce dependence on supplemental irrigation. The existing PVC irrigation was non-functioning. (PVC is not recyclable and is a top 5 carcinogen.) We redesigned and installed a new and much more efficient drip irrigation system that was PVC free (made of recycled and recyclable materials), dramatically reducing water usage and other ongoing maintenance related costs. Drainage routed to a new hillside fruit orchard to capture and direct natural rainfall. 15 substantial fruit trees were brought in (several types of citrus, almond, pomegranate, apple, apricot) . Around the perimeter of the property's 3 acres, we brought in more native plants for transitional beauty out into the adjoining wilderness and also to bear seasonal seeds and fruit to support local foraging wildlife. 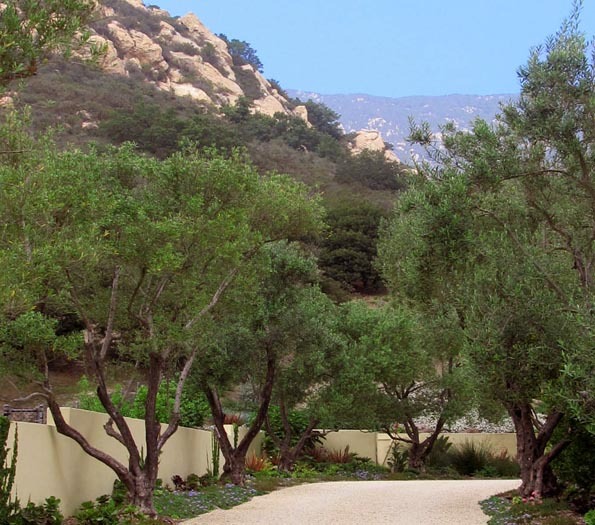 As this is a fire prone location, ornamental trees were thoughtfully placed around the home's perimeter to create an attractive and invisible fire-safe "defensible" space. Lush and beautiful succulents were also planted around the perimeter of the house itself as a "fire-brake", as these plants do not burn / do not provide fuel to possible fire threats. Liberal use of mulch for weed control, retains soil moisture, reduces maintenance costs, and naturally revitalizes the soil as it breaks down over time. Deciduous trees planted on south side of home to provide passive summer shade and winter solar warmth. To fully realize the new garden designs, several sizable, established trees on the property had to be removed from their locations, but we were able to savaged them and use them elsewhere on the property where they perfectly enhance the overall landscape design. LED Lighting – 2 watts per fixture with life expectancy of 20+ years. Local vendors, contractors and craftsmen employed, supporting the local community and economy.